when it comes to computer hardware, there isn't much i haven't worked with or repaired! 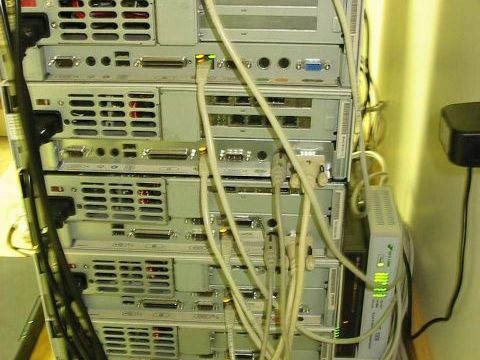 my primary interests are in cluster based computing, used for hosting network services, running IBM AIX or GNU/Linux. 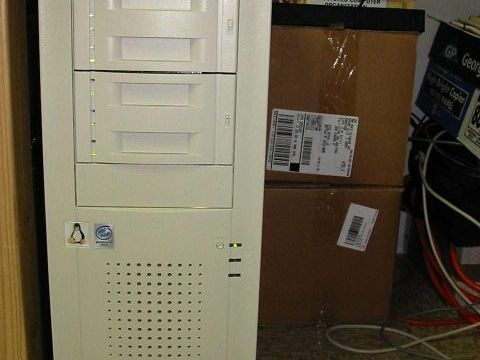 this beauty is one of my favorite machines, and has ran reliable since the very first day i installed Debian GNU/Linux. it has been given numerous hard drive upgrades over the years, and currently houses my primary Raid5 storage arrays, md0 and md1. their current combined storage space is just under 2 terabytes, thats a lot of jpeg data! there isn't much i can say about this server, it fires up once a week to pulldown all my data for backup on its storage arrays, fully automated. right now i am evaluating kubuntu 7.10 for a system software switch, which will be the first kubuntu addition to my cluster, stay tuned, this might be my first package release for kubuntu! 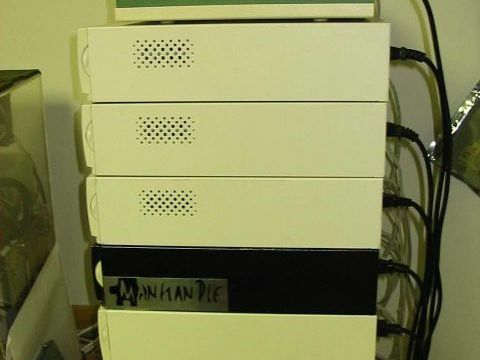 this is my personal computing cluster, running Debian GNU/Linux, OpenMosix and a custom 2.4 linux kernel. most hardware in these photo's is focused on the deskpro stack of pc's sporting 80gig drives, 512mb memory, and SMALL 90W power supplys! These machines were designed to go the long haul, and besides a few WOL issues, have few bugs and a ton of features. when i combine these sentinals with powerful desktops also running OpenMosix kernels is when the power cycles get stretched. i have since added 2 dual xeon machines, both supermicro motherboards, and 2 AMD 1ghz desktops to increase my clusters power more than 10x! I am working on configuring 2 AMD64 desktops currently in use as workstations, but it looks like i will need to retool my kernel and move to 2.6 finally, but that will happen with time! while dated, this computer is still enlisted in my reserves. 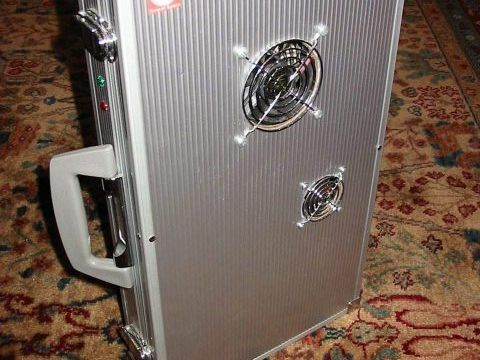 its basically what it looks like, a computer inside of a small briefcase. the hardware inside is dedicated to headless networking tasks, most commonly used for MITM evaluations, bridge applications, and honeypot temptations. 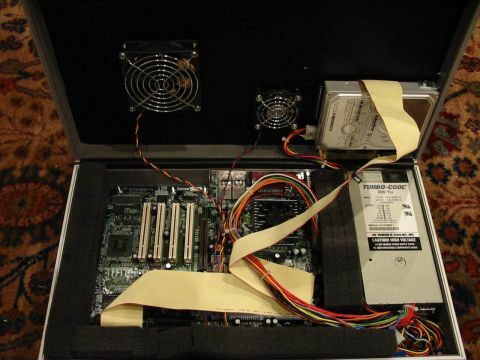 the hardware is a supermicro rackmount motherboard, with dual eepro100 nics, 1gig of memory and a large hard drive. most consideration was given to airflow, and cooling, and includes a PC Power and Cooling 1U 200W power supply. this is a hack job worthy of my name! this was a retired HP netserver which originally had a pentium pro in it, remeber those? 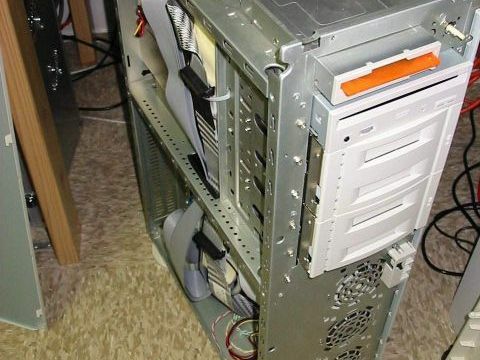 i gutted it and installed a dual xeon 550mhz-2mb 1gig and a few scsi drives, but to get the most available drives i doubled up the scsi cages and installed another 8 drive bays on the back! power consumtion was qwenched using a Enermax 1200W powersupply, and i had to add a handful of extra power rails to power the additional cages. in the end she runs great, and has been in service at my co-location for over 5 years without incident! i am just happy that i am not paying the power bill!